This sculpture was created in 1987 by Polish artist Igor Mitoraj. It is located near the Old Town Hall on the Lower Bridge in Bamberg. In the background you can see Michelsberg Abbey, which is currently being renovated. 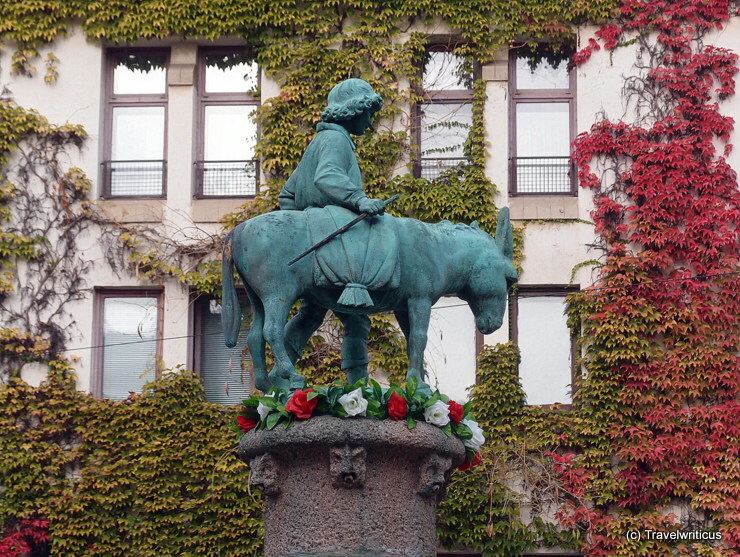 The Donkey Fountain (Eselsbrunnen) on the Old Market (Alter Markt) in Halle (Saale) was built in 1913. The bronze sculpture was created by the sculptor Heinrich Keiling. The man who walks with a donkey over a rug of roses refers to an old legend. 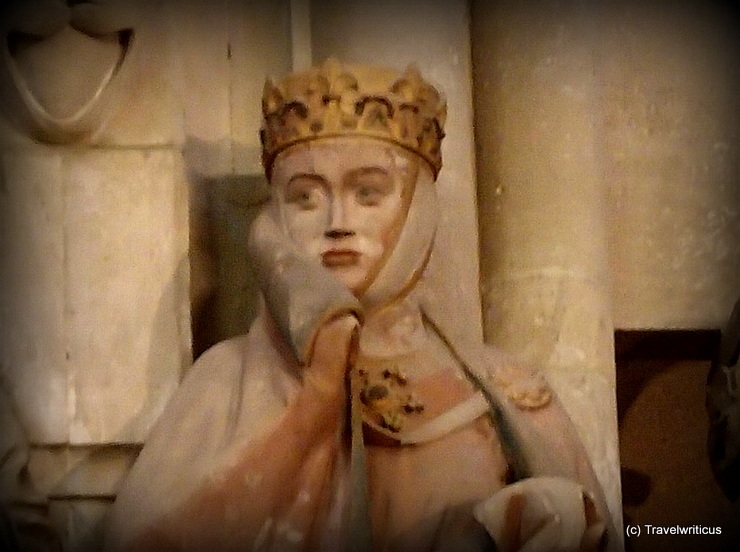 This sculpture is one of twelve donor portraits located in the west choir of Naumburg Cathedral. Due of the beauty of the depicted lady it is the most famous one of the twelve. 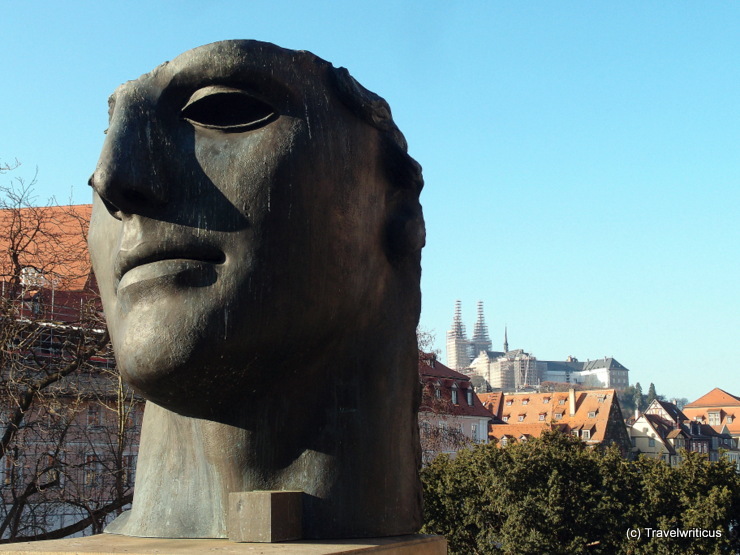 The name of the lady was Uta von Ballenstedt, but in general people just call the sculpture Uta of Naumburg. This sculpture in the city of Rostock named ‘Seven proud sisters are kissed by one sea’ (Sieben stolze Schwestern küsst das eine Meer) was created by Reinhardt Dietrich in 1985. It portrays the peaceful coexistence of the seven countries surrounding the Baltic Sea. I wonder about what these three maids are talking? The fountain and the groupd of girls was created by the sculptur Günther Kaden. 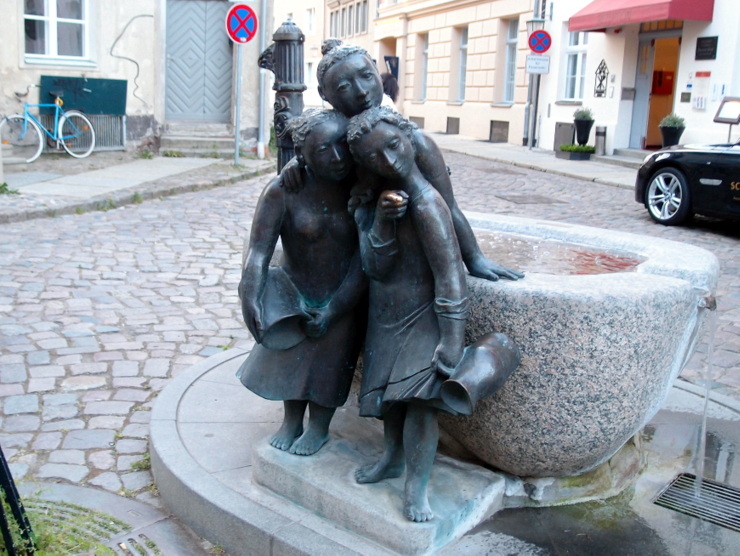 He titled his work Drei-Mädchen-Brunnen (Three Girls Fountain). People of Stralsund prefer to call it Die Geschwätzigen Weiber (The Garrulous Women). 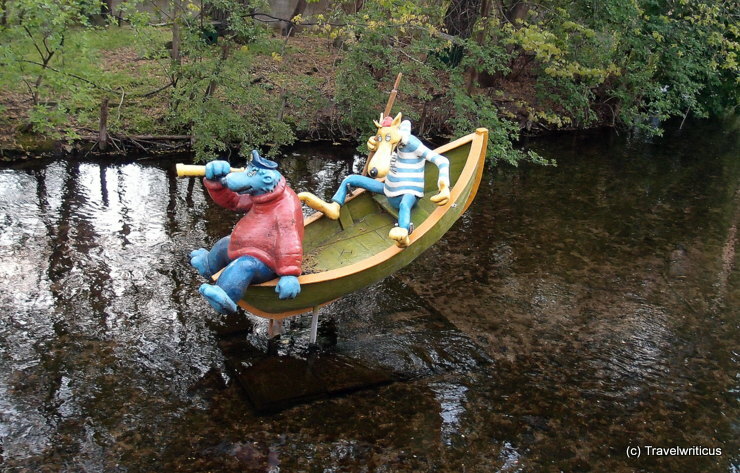 These sculptures on the river Gera in Erfurt represent Käpt’n Blaubär and Hein Blöd. Both were stars in a German children’s comedy television series. Käpt’n Blaubär (Captain Bluebear) also appeard in the educational children’s television series Die Sendung mit der Maus. 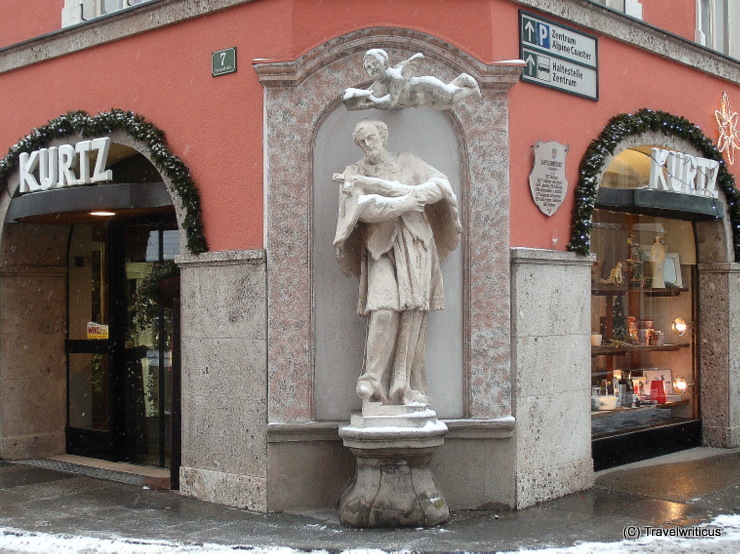 This statue of Saint John of Nepomuk is located at a building named Ehemschiedhaus. The buildings is dating back to 13th century, the sculpture was created in the first half of 18th century. Love the flying angel above his head. Memories! For many children in Germany and Austria, these wise guys were stars of the TV series Die Sendung mit der Maus (The Show with the Mouse). 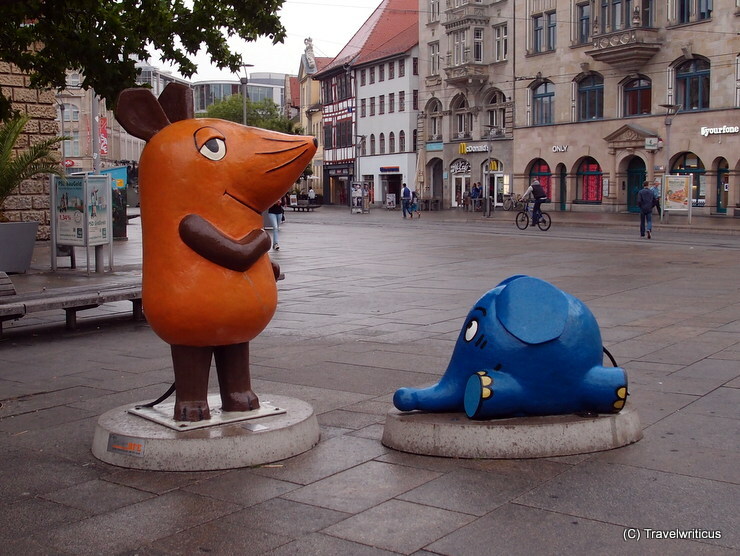 If you look carefully on your urban walk through Erfurt you will find several protagonists of German children TV series. 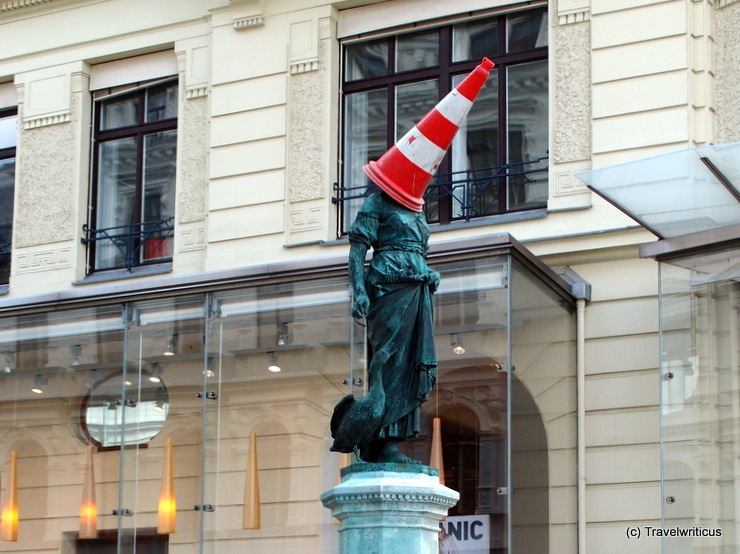 Someone in Vienna obviously doesn’t like monuments. The photo shows the Gänsemädchenbrunnen, a fountain located near the Museumsquartier in Vienna. 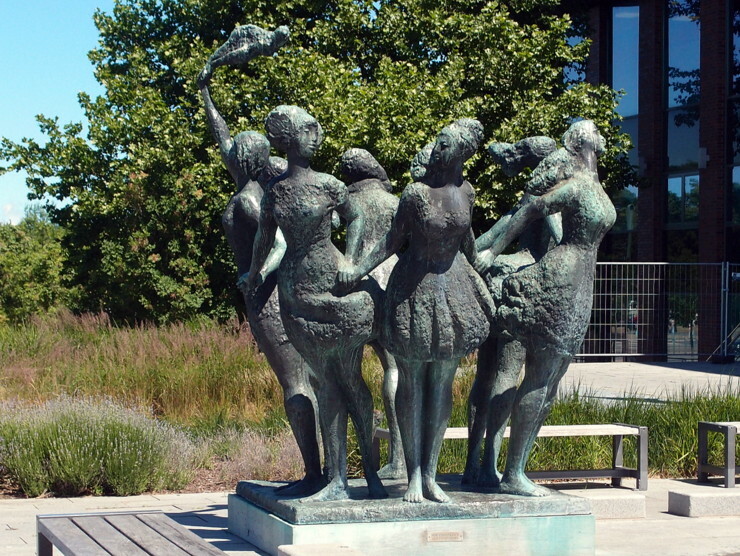 The sculpture features a girl herdering geese and was created by the Czech sculptor Antonín Pavel Wagner. 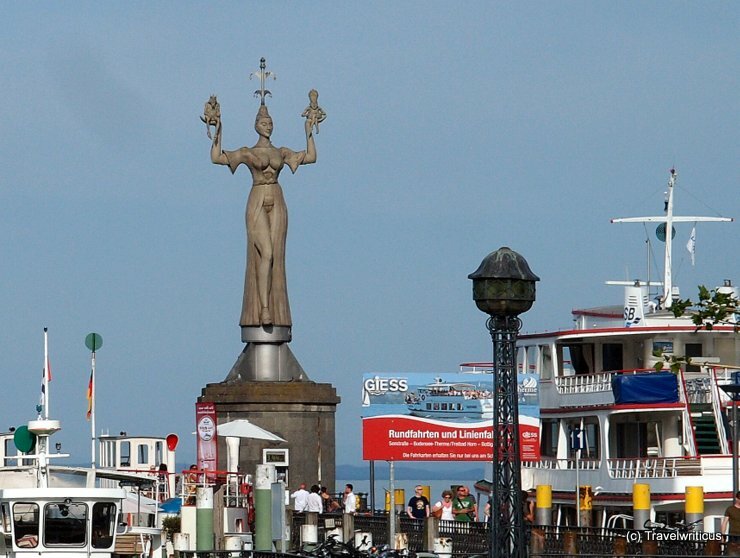 The statue of Imperia is placed at the port of Constance (Konstanz) It reminds of the Council of Constance in the years 1414-1418.